Imperfections – will they be missed? As a beer drinker I go through many many bottles, probably too many… but I recycle, I promise! What I’m trying to say is I encounter bottles on a daily bases, many breweries these days design their own bottles that differ quite a bit from the narrow-mouth brown/green bottles we are all used to. New designs include embossing the brewery names or logos on the bottles, adding embossed designs, bands and patterns and etching information about the beer and brewery right into the glass! While these are all very neat, after working with some historic glass, I realized they lack a bit of ingenuity and uniqueness. 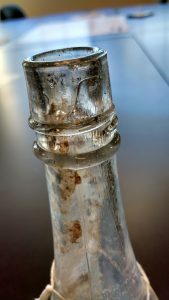 Most bottles we encountered in our historic glasswares lab included debri on the inside, breaks and cracks, imperfections, wear and tear, etc. All of these faults gave each bottle its own unique look and feel, and also it’s own story. How did each bottle get these imperfections during manufacture? How did each bottle get all these cracks? What can this debri tell us, is it just the remnants of an unfinished product or was it used multiple times? One bottle that certainly has a story to tell is 45KI765/M-10. 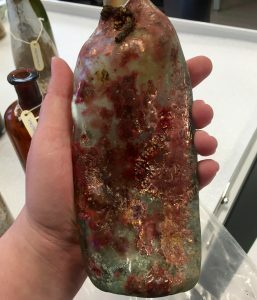 This is most likely an ale bottle that is green with a crown finish. While it has mold seams all the way through the finish; signifying a machine finish, the exterior has many imperfections as well an orange peel texture. The imperfections, like waves moving over the body of the bottle, seem to be almost intentional; creating this wave pattern design – it is very very unique! Being a bottle with a machine finish with many imperfections I would date it to the very early 20th century. The makers mark reads; “JL & Co LTD 684”, however online searches didn’t yield any results outside of finding that most JL & Co bottles were made pre-WWI. I would assume this bottle held a common beverage; soda or beer. However I am curious to the life story of the bottle. 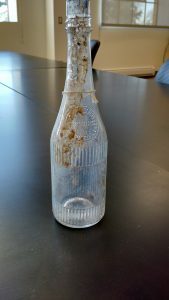 Despite being a common beverage bottle, whoever drank it must have seen that the imperfections made a delightful pattern that might have been rare in bottles of that time. I am curious if that person considered saving it, if they noticed it’s uniqueness or if this is only a trait that we start noticing once all our bottles are manufactured flawlessly. Despite their age, most of the bottles that I worked with this week were largely whole and undamaged; I was able to observe their color, feel the seams, and discern maker’s marks with only a moderate amount of difficulty. I was finally gaining confidence in my bottle-identification skills, when I came to the last bottle in my assemblage, catalog number 45KI765/M-4. 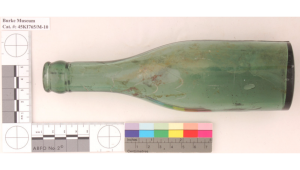 It was a heavily damaged bottle, its original shape, color and label barely discernible. I hardly knew where to begin. Normally I would identify the finish, bottle shape and use type first, but the neck and finish were missing, the shape had been completely distorted, and any decoration or label that once existed was obscured by an unidentified dried substance. I decided to try and find any feature on the bottle that might make it stand out, and the only possibility that I came up with was to somehow identify the embossed label. I tried a few different techniques; I felt the letters with my fingers and held it up to the light at different angles; I photographed it on my phone and adjusted the color and contrast; and I used a piece of paper and a pencil to try to create a stencil. Finally, after much effort, I put together “ZAREMB” on the top of the label, “SPR” in the middle, and “SEATTLE WA” on the bottom. Armed with the little information I gleaned from the label, I resorted to the best archaeological tool I could think of to solve this mystery: the internet. 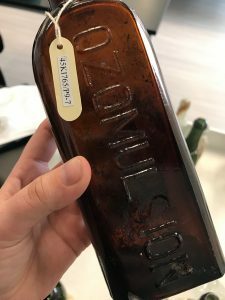 After reading about various different people named Zaremba (there was an opera singer, a Russian composer, and a family of Polish nobility) I finally found the right combination of letters and was able to determine that the bottle came from Zarembo Mineral Springs Company. 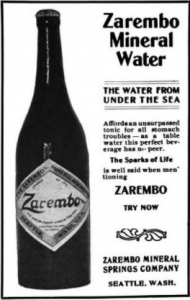 It once contained mineral water from the Alaskan island of Zarembo and was marketed as a health drink from 1900-1920. Presumably, it was dumped at the site by an individual who was perhaps hoping to improve their health by consuming the magical healing waters of Alaska (or maybe they were just thirsty). While this was all very fascinating, I was a little bit disappointed that this mysterious bottle and all of my effort hadn’t let me to something more interesting, a sinister poison perhaps, or an illicit concoction. Oh well, there’s always next time. This is an amber medical bottle which contained Ozomulsion. 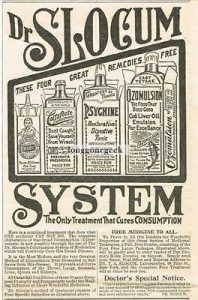 Ozomulsion was “considered” to have been the cure for consumption (pulmonary tuberculosis) during the time it was manufactured. 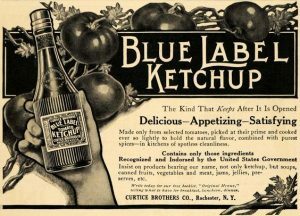 In researching the glass container, I discovered the bottle was first introduced in the 1880’s. It was manufactured in London, and New York. Dr. M. Donald Blaufox states that ads for Ozomulsion appeared as late as 1948. The amber bottle has large letters embossed on the front which spell “OZOMULSION”. Since the bottle is rather large, I would presume one would need to pour the contents into a separate container prior to using it. I would certainly expect Ozomulsion to have been in this bottle in the time it was discovered. Considering it was assumed to have been the cure for “consumption”, I would also suspect parents purchased the product for their children. It’s likely that anyone who believed this was the cure for consumption would have purchased this product if they were able.